Burkholderia pseudomallei colonies on a Blood agar plate. Image credit: CDC/Courtesy of Larry Stauffer, Oregon State Public Health Laboratory (PHIL #1926), 2002. (Phys.org) -- Conventional wisdom says that in order for a species of insect to develop resistance to an antibiotic, several generations have to pass, whereby genes from those that have some natural resistance pass them on to their offspring. But sometimes conventional wisdom fails to take into account how some bugs can find a work around. In this case, its the bean bug. Researchers in Japan have found that for Riptortus pedestris, the common bean bug, there is a much quicker path. All they have to do is ingest the Burkholderia bacteria. Doing so, the team says in their paper published in the Proceedings of the National Academy of Sciences, makes them nearly impervious to the insecticide fenitrothion, which has historically been used to treat soy bean plants to protect them from the bugs that dine on them. To find out what was going on with bean bugs and the Burkholderia bacteria, the researchers added the bacteria to potting soil in the lab, where they flourished. They followed that by adding fenitrothion, which the bugs ate with abandon. Next, they introduced some young bean bugs (nymphs) into the pot which ate soy bean seedlings the researchers added to the mix. In examining the guts of the bugs, the researchers found the bacteria continued to thrive and the bugs became immune to the effects of the insecticide as a result because the bacteria was eating it before it could harm them. Normally, they say, up to eighty percent of bean bugs will die from such an exposure. In further tests, the researchers found that bean bugs can harbor up to a hundred million bacteria in their guts, which tends to make them larger than others of the same species. Fortunately for farmers in Japan, however, it doesnt appear that many of the bean bugs, or their close cousin chinch bugs, swallow much of the bacteria in the wild though. 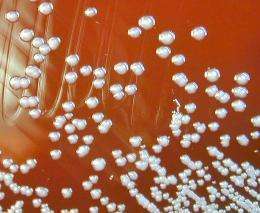 Tests done found that only eight percent of such bugs had Burkholderia bacteria in their guts in one area, and none in another, thus very few were able to develop an immunity to fenitrothion. The research team says that this symbiotic relationship between bean bugs and Burkholderia bacteria, providing the bugs with immunity from an insecticide, is the first such example ever found. But they also note that because its been found in this case, its likely occurring in other relationships as well. Development of insecticide resistance has been a serious concern worldwide, whose mechanisms have been attributed to evolutionary changes in pest insect genomes such as alteration of drug target sites, up-regulation of degrading enzymes, and enhancement of drug excretion. Here, we report a previously unknown mechanism of insecticide resistance: Infection with an insecticide-degrading bacterial symbiont immediately establishes insecticide resistance in pest insects. The bean bug Riptortus pedestris and allied stinkbugs harbor mutualistic gut symbiotic bacteria of the genus Burkholderia, which are acquired by nymphal insects from environmental soil every generation. In agricultural fields, fenitrothion-degrading Burkolderia strains are present at very low densities. We demonstrated that the fenitrothion-degrading Burkholderia strains establish a specific and beneficial symbiosis with the stinkbugs and confer a resistance of the host insects against fenitrothion. Experimental applications of fenitrothion to field soils drastically enriched fenitrothion-degrading bacteria from undetectable levels to >80% of total culturable bacterial counts in the field soils, and >90% of stinkbugs reared with the enriched soil established symbiosis with fenitrothion-degrading Burkholderia. In a Japanese island where fenitrothion has been constantly applied to sugarcane fields, we identified a stinkbug population wherein the insects live on sugarcane and ≈8% of them host fenitrothion-degrading Burkholderia. Our finding suggests the possibility that the symbiont-mediated insecticide resistance may develop even in the absence of pest insects, quickly establish within a single insect generation, and potentially move around horizontally between different pest insects and other organisms.